Many wine lovers claim that Burgundy wines — from the Burgundy wine region of France — are the greatest red wines in the world, while others insist that Bordeaux wines hold that claim. Nothing quite compares in aroma and flavor to a great red Burgundy. Burgundy is a long, narrow wine region in eastern France, southeast of Paris. 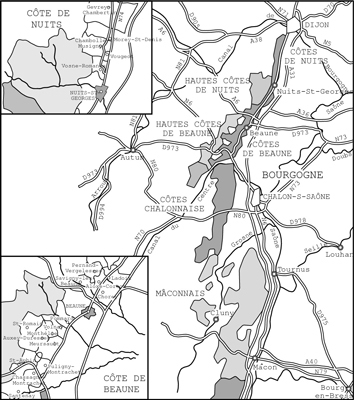 The French call the region Bourgogne, pronounced bor guh nyeh. Burgundy is a fragmented region, consisting of four somewhat contiguous districts (Chablis, Côte d’Or, Côte Chalonnaise, and Mâconnais) and one district that’s about 70 miles south of the other regions (Beaujolais). The Burgundy wine region encompasses several districts. Because of its unique terroir the Burgundy region excels in both white and red wines. The soils of Burgundy are extremely varied, in their richness, depth, and mineral content. The soils vary not only from one end of the region to the other, but also within a single area — for example, from the top of a hill to the bottom, or from one vineyard plot to the next. Most vineyards have a base soil of limestone overlaid with limestone and marl (a mixture of clay and limestone), sometimes mixed with sand or gravel. Where limestone is dominant, white wines grow; where more marl exists, grapes for red wine grow. Pinot Noir is notorious for being difficult to cultivate, because it requires very specific soil and climate parameters to produce its best fruit. Burgundy has that climate and soil. The Burgundy region has more success with this grape than any other wine region. Red Burgundy wines are the world’s finest examples of this challenging, but delicious, variety. Chardonnay is the other important variety in the Burgundy region, and the basis for the region’s most important white wines. Although Chardonnay is a nearly universal variety today, it reaches its height in Burgundy, where it makes complex, masterful wines that can age for decades. Burgundy is a region of small vineyards, mixed ownership of vineyards, and relatively small production. Burgundy produces a total of about 22 million cases of wine annually. This quantity is only about a small part of Bordeaux’s production. Burgundy’s vineyards are also much smaller than Bordeaux’s, meaning that less wine is available from any one vineyard. Where large vineyards do exist in Burgundy, they have multiple owners, so that many different wines exist from that one vineyard. The wines are expensive because production is small. Multiple brands of any one wine are available. The name of a vineyard isn’t a reliable indication of a wine’s quality, because every vineyard has several owners and winemakers, who vary in dedication and ability.